A bike light with so many useful functions? Check out what it can do and how it does it! Is it raining outside? Snowing? No worries, you can still ride your bike with Blinkers. It is fully water resistant and complies with IP-64 standards of International Protecting Marking. You don't want to charge your battery everyday? Every two days? Or even every week? No problem! 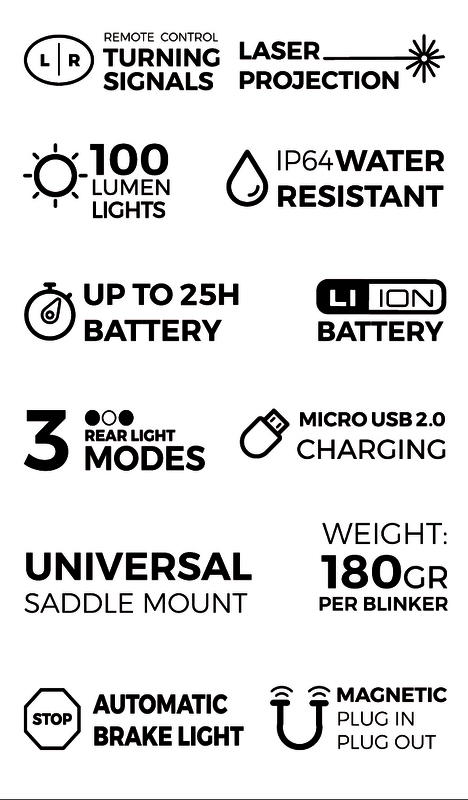 Blinkers has a very powerful battery with a capacity of 3200mAh which will allow you to use it for as long as 2 weeks in a normal usage (2h riding per day). These are two of the many technical features of Blinkers, with which we aim at having a top quality and durable product. An amber dynamic arrow is activated when pressing the R or L button on the remote control. The turn signal is visible from great distance, and allows cars to understand your intentions. Mark your territory on the city roads, and cars will overtake you giving you the space you need. This mode is only available in the Laser Blinker and the Laser Set. Durability and quality are very important for us, and that is why we only use the best components for our products: whether it is for the automotive Cree LEDs, for the Tesla Li-ion batteries, or for the top-notch plastic materials. Proximity is also a key aspect of our company and we decided to produce Blinkers in Europe, more specifically in Switzerland (where we work) and in Spain (where we are from). This allows us to have a very close relation with our manufacturing partners and our fulfillment center. To bring to the market our first ever product, we have teamed-up with the Swiss design consultancy Sapetti to develop the design and user experience of the Blinkers system. A key feature of the design was to maximize the visibility of the blinker and to make it understandable by cars. The shape of the Blinkers has been strongly driven by ergonomic questions, to make sure it does not interfere with the cyclist leg movements, but also that in case it does it does not pose any problem.